The following are all websites we’ve improved within the last 12 months – updated March 2019. This is because we don’t just rest on our laurels, we consistently improve our techniques to keep up with Google algorithm changes. The image above shows a traffic graph for a client who came to us in January 2018. Within 1 year, we have TRIPLED their traffic from Google, now around 4,400 searches per month. This has seriously improved their bottom line, and we can do the same for you. We performed an SEO audit and long term SEO services for this company, helping them to establish themselves in the market within 1 year. 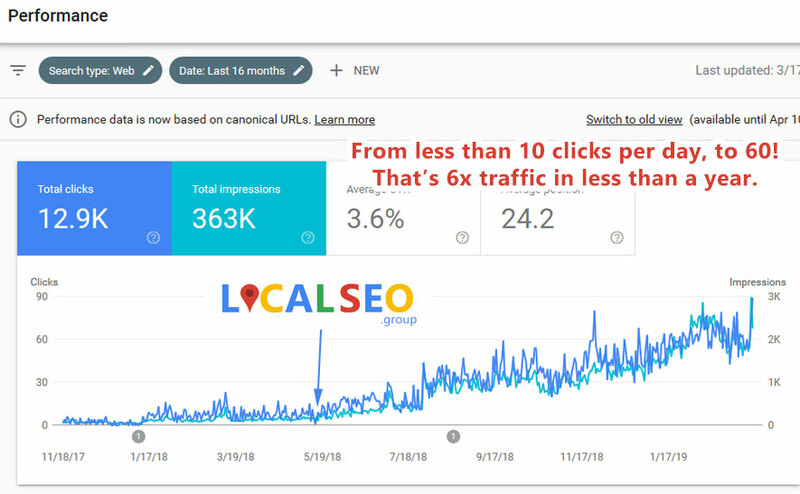 This website had SEO services for 6 months, and has managed to go from nothing to a reasonable amount of traffic in a very short space of time. This is directly improving their revenue. This business previously relied heavily on PPC and branded traffic. We managed to successfully implement a technical SEO audit and ongoing services, to help them achieve considerable organic success, which means they NO LONGER have to spend on Google PPC. This outdoor activity website gets 4,500 visitors per month, all from our organic SEO services. It’s become one of the leading websites in the industry. For those who want to know more, you must first agree to follow our client rules.